Posts Tagged "Long hair dressed"
Home » Posts Tagged "Long hair dressed"
Introducing some beautiful hair inspirations by Roberto Perozzi, RPH Salon, Tokyo, Japan. He calls these gorgeous avant-garde looks “Hooks and Eyes” and we found them on two pages with more wonderful work in the December issue of Peluquerias Magazine. He has used silver clasps fastened on to the hair with hooks and eyes, used to great effect here and there on long straight hair. 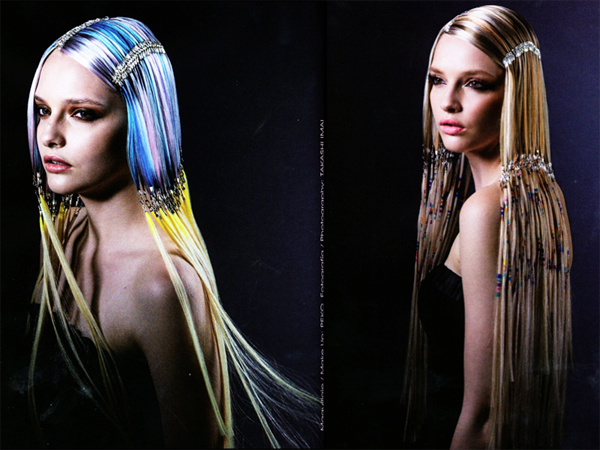 The hair colors on the left are blue, gray, pink, yellow and the photo on the right is equally effective on a blonde. Perozzi has quite a background. Trained in Italy, then to Toni & Guy Advanced Academy in London, next to Trevor Sorbie, where he became the International Coordinator for the Trevor Sorbie Artist Team traveling the world educating, and since 2012 he has been in Tokyo.